Aaaah, the worlds finest ex-Iron Maiden vocalist is here again with his own band and their third studio offering, Blood & Belief. Once again Blaze Bayley and the crew show why it definitely was the best for both Maiden and Bayley himself that they parted ways professionally and allowed the one and only Air Raid Siren take over the helm of Maiden. This album is heavy. At points, even brutal. But not so much in the sense that it would be hyper speedy 24/7 or that Bayley would suddenly try and imitate Chuck Billy, but more in the atmosphere and attitude in the material. The feel on many songs is just so damn heavy, along with the excellent band performances and Blazes awesome vocal performance. His voice hasn’t changed one bit, but the delivery here is very emotional, as is the whole album. All the songs have a unifying theme of overcoming adversities and beating difficulties in life. The futuristic, sci-fi concepts of Tenth Dimension are out the window and in are the personal stories of real life, pure and simple. The theme brings out the best abilities of Bayleys deep and dark croon, that I have always liked. It didn’t suit Maiden that well, but it suits his own band like the hammer to the nail. Steve Wray and John Slater provide solid guitar work that alters nicely between brutal riffing (Hollow Head) clean melodic picking (Soundtrack Of My Life) and blazing solos (Blood & Belief, Will To Win, Alive). Unfortunately I couldn’t find the name of the drummer on the album, but who ever it is, he does a damn fine job. Nice double bass flurries, tight beats, and doesn’t overplay anything. The songs range nicely from the speedy rockers like the title track and Will To Win to the more thoughtful and soulful mid-tempo rockers like Life And Death and Regret. Many songs remind me of a mix of latter day Iced Earth and Bruce Dickinsons later solo work, only with Blazes voice on top. The production is a bit more raw, and not too polished around the edges, but it still packs a mighty punch, as nothing gets buried beneath the roughness. Everything is audible with perfect balance and power. The punchy production only makes the riffs and songs sound more heavy and especially more modern. I think a very good reference point to this album would be Bruce Dickinsons Chemical Wedding solo. Someone coined a very good “genre” for that album, “True New Metal”. That description would also describe this album very well. 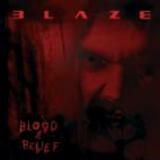 The most heartfelt album and especially greatest vocal performance in Blazes career, and I would not hesitate to go as far as to say that this is the best album that Blaze Bayley sings on in general, music and all. To everyone who likes very well made, mostly classic sounding heavy metal with still some modern touches and sounds, awesome melodies and guitar solos, and a bellowing voice and rhythm section to boot, go get Blood & Belief on your hands and feel the emotional strength that charges on these ten tracks. Its very impressive and pretty darn catchy at the same time.